GFT’s new Cinema 3 officially opens on Friday 29 November with a 1.15pm screening of immersive documentary Leviathan. The third screen will allow development of the Festival and increase GFT’s education and outreach work, alongside potential to screen more niche films and provide longer runs for popular films. Cinema 3 will also provide a fantastic hub for Glasgow Youth Film Festival. Cinema 3 opens just as Glasgow Film Theatre prepares for its 75th birthday celebrations, which will commence at Glasgow Film Festival in early 2014. Paying homage to this anniversary, and to the building’s history, much of the design for the third screen and for the revamped entrance foyer has been inspired by the original Art Deco and Art Moderne styles of The Cosmo, which opened in the Rose Street location in May 1939. To celebrate the opening of Cinema 3, and as part of the cinema’s wider seventy fifth birthday celebrations, GFT are hosting an open day on Sunday 8 December (from 12noon), where audiences will be invited to take a sneak peek behind the scenes of one of the UK’s leading independent film theatres. Guided tours of the projection booth will take place at 12noon, 12.20 and 12.40 and at 13.00 there will be a panel discussion with the Glasgow Film team, followed by a free screening of a surprise film. Designed by the award-winning NORD Architecture, the new stylish sixty-seat screen will offer a comfortable and high-quality viewing experience. Drawing from the cinema’s heritage, a palette of materials inspired by the original 1939 design by architect James McKissack, including brass, sustainably sourced teak and terrazzo, maintain a continuity of detail and craft. The plush leather and teak-backed seats will further enhance the boutique aesthetic. Central to NORD’s approach was cultivating the audience experience from the moment the building is approached. Digital flat screens installed in the entrance area’s new concertina wall, juxtaposed with bronze mirrors, again alludes to the cinema’s heritage, whilst evoking a contemporary feel. A new teak-lined box office with terrazzo counter will be returned to its original location at the main entrance. A canopy with cabaret lighting, kiosk, and reconfigured toilets by the entrance to Cinema 2 and 3 will also be unveiled on Friday 29 November. The creation of Cinema 3 was made possible with the support of Major Funding Partners, Glasgow City Council, Creative Scotland, The Robertson Trust, Garfield Weston Foundation and Biffa Award – Building Communities. Transforming Lives. Janet Archer, Chief Executive at Creative Scotland, said: ‘Creative Scotland is proud to show our continued support of Glasgow Film Theatre as it opens Cinema 3. 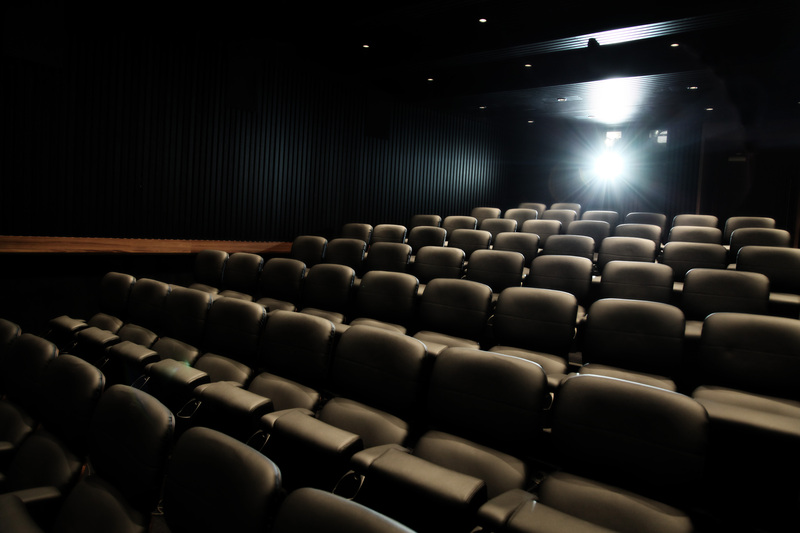 The cinema will not only improve audience experiences with screenings of an ever eclectic array of films, but will also support the GFT’s learning and outreach programmes. The Cosmo, Scotland’s first arts cinema and the second purpose-built arthouse cinema in the UK, opened on 18 May 1939. The cinema’s icon, Mr Cosmo, was a dapper-suited gentleman whose bowler hat still forms the lighting feature in the current Cinema 1. The Cosmo reopened as Glasgow Film Theatre on 2 May 1974. Glasgow Film Theatre was classed as a B-Listed building by Historic Scotland in 1988. The next phase of work, which is planned for 2015, will focus on the creation of a new downstairs bar area. Top-lit with a newly inserted roof light, this will bring a suitable crescendo to the entrance, as well as a destination for pre and post-screening drinks. Also included in the next phase are reconfigured toilets at the rear of the foyer, improved lift access andbutterfly staircase. Again, harking back to the original design, the butterfly staircase reinstates a sense of the drama and theatre to the art-deco cinema.